Hardcover, 6.5 x 9.5 in. / 212 pgs / 150 color. Edited by Roland Schöny. Text by Christian Höller, Gaby Gappmayr, Annelie Pohlen, Roland Schöny. Vienna has hosted a number of ambitious collaborative public art projects in recent years, started by the Public Art Vienna program. 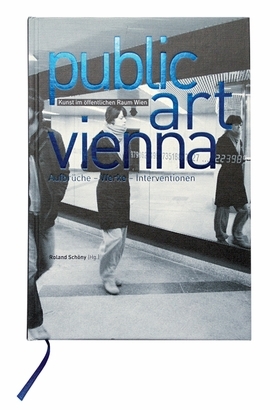 This volume gives an overview of the initiative, documenting installations by artists such as Peter Fattinger, Heinz Gappmayr, Liam Gillick, Maria Hahnenkamp, Oliver Hangl, Ken Lum, Inés Lombardi, Veronika Orso, Michael Rieper and Franziska and Lois Weinberger. 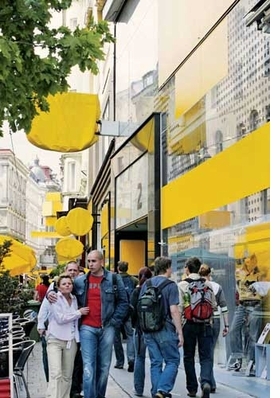 Featured image, of a public artwork by Christoph Steinbrener and Rainer Dempf, realized June 6–20, 2005 in the Neubaugasse shopping district in Vienna, is reproduced from Public Art Vienna. FORMAT: Hbk, 6.5 x 9.5 in. / 212 pgs / 150 color.